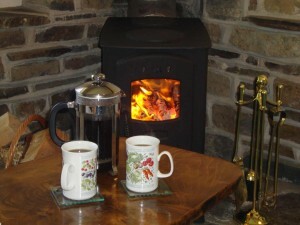 It has been a very busy year here at Lower Hearson Farm. October half term was great fun with a trusty band of helpers working very hard on the feeding runs. 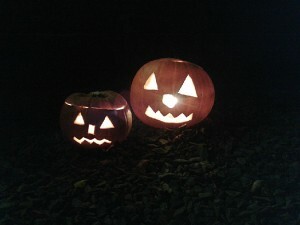 The display of pumpkins that the children produced was very atmospheric on halloween night with their candles gently flickering away. 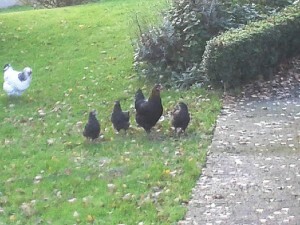 The chicks that hatched under the hedge by the cottages are growing really quickly (see photo below). 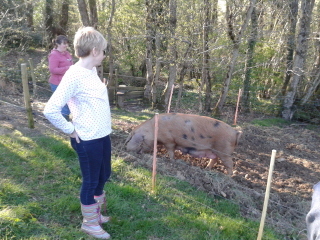 Acorn is in pig with her piglets due in January. She is getting bigger every day now and we are hoping for a mild couple of weeks when she is due to farrow. The pigs were moved in to their winter quarters in November when the field became far too wet. We had a fun time at Christmas with the children receiving a visit from Farmer Christmas on Christmas Eve, much enjoyed by all. We tried to take a photograph of him but unfortunately he managed to sneak out of the way of the camera. Better luck next year! 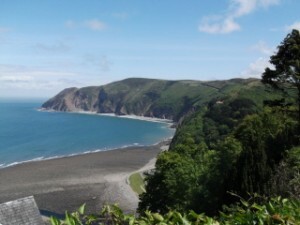 We have met some wonderful people who have come to stay with us this year and we would like to thank you all for making 2014 such an enjoyable one. Happy Christmas and a Happy New Year to all. What a fabulous September we have had! Lovely warm, dry weather every day. The hedgerows are packed with berries, sloes, nuts and all forms of autumn fruit. A fantastic colourful show. Everyone has been out foraging. Our guests have been making plenty of apple and blackberry crumbles and plenty of sloes are in the freezer ready for sloe gin making in October. The blackthorns still have plenty of sloes left for the wildlife when autumn properly arrives. We collected all our straw from the fields and stored it away in our barns for the pigs winter bedding. 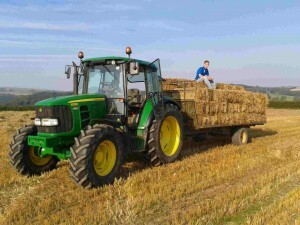 Hard work and plenty of itching from the straw throughout the afternoon and in glorious evening sunshine. 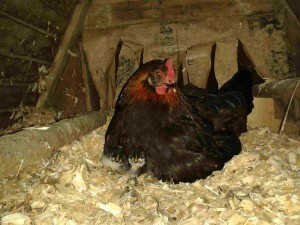 One of our chickens who had been seen hiding under a hedge suddenly appeared with a familiar cheep – cheep sound as she was being followed by three little unexpected chicks. Everyone was delighted. We then had to rush around setting up the maternity pen and catching the family to make sure they were safe from any predators. Sheep shearing has begun again for another year. All the mums in our field look very neat and tidy now. We made elderflower cordial for the first time this year. Very well worthwhile the effort. We recommend you all have a go. Instant taste of summer in a glass! Summer is the time for sowing the pig’s winter kale so it can grow well in the fine weather. It needs fencing well as the sheep are always looking to get in as they love the young green plants. 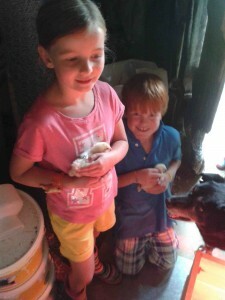 Our summer batch of chicks hatched out in July. They were a mix of Light Sussex, Ixworth and Cream Legbar. Ixworth and Cream Legbar are new breeds for us. It will be interesting to see how they grow up. June and July this year were again very warm. 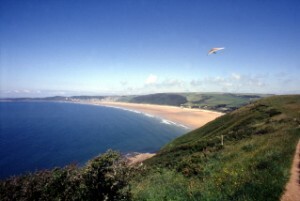 Proper summer days for everyone to thoroughly enjoy following the wet winter. The vegetable plots have been producing enthusiastically giving plenty of fresh produce to eat and try to get into storage ready for the winter. 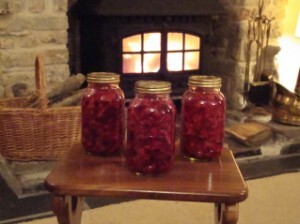 We make a lot of our own jam, pickles and chutneys. This year, because of the glut, we had to buy some extra jars in to be able to store everything. Rapidly running out of cupboard space! 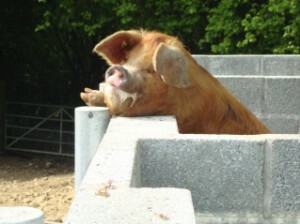 The pigs are having a well deserved rest and enjoying the summer sunshine immensely whilst lying in their wallows. They always look so relaxed, without a care in the world, until we turn up with dinner! We have had a lively market for piglet sales this year. We could have sold all our litters 3 times over. We said cheerio to Maple’s 8 piglets this month. All off to good homes. 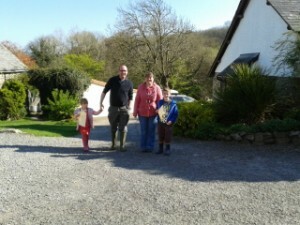 Our May half term gang helped to move Runty and his brother “Not So (Runty) up to the woods. 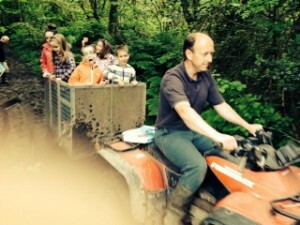 Great fun had by all with the quad bike and trailer and some very well behaved piglets. Our first batch of chicks hatched just in time for Easter. We had a mixture of Cuckoo and Copper Black Marans this year. 16 out of the 18 eggs that we set have hatched so we are very pleased. The swallows arrived back on the 12th April nearly a week earlier that usual. testament to a generally mild spring. Phoebe farrowed on the 19th April. 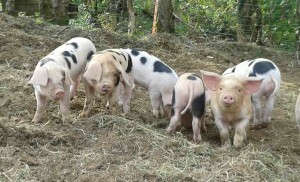 Eight healthy pure bred Oxford Sandy & Black piglets. The Easter Egg hunts were a great success with some new questions to test the farming knowledge which the children had learnt during the animal feeding. 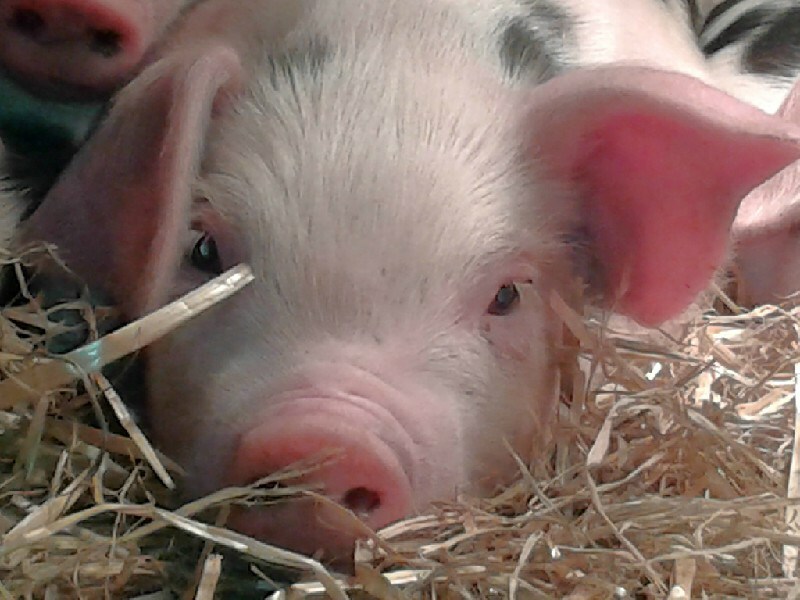 We sold 5 of Acorn’s piglets this month but kept Runty the Gold Plated piglet and one of his brothers for ourselves. They will go up to the woods for the summer. Acorn farrowed at 1am on the 9th March. We stayed up all night with her as it was her first farrowing to make sure she was alright and to hold her trotter throughout the experience. 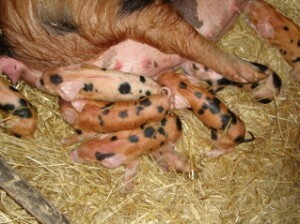 7 healthy piglets including one very small runt. All fine when we left them at 5am. We went to check at 7am to find that she had trodden on the runt and badly cut its leg. Just when a quiet day was needed to recover from the night before it was off to the vets to get him stitched and have some antibiotics. 9 stitches later he was back in a cardboard box in front of the range having a bottle of milk and a little recover from his ordeal. 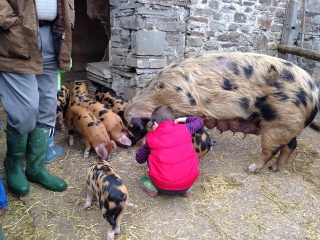 By lunch he was starting to become mischievous so we popped him back with mum who by this time was beginning to work out what a piglet actually is and was being more careful. We call the runt gold plated due to his vet bill. We have decided to keep him with us rather than sell him as we have become attached to him. We set some eggs in the incubator ready to hatch out in time for Easter. 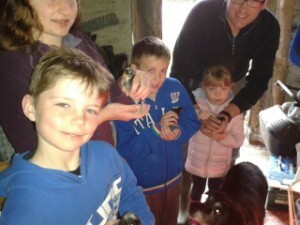 Fingers crossed for little chicks during the Easter holidays. Maple farrowed at 3am on the 24th March. 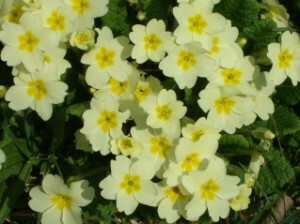 We are having a busy spring with young animals as the sheep and their lambs are also starting to arrive in the field. 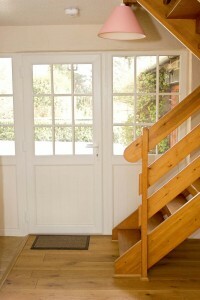 We had new doors fitted to The Threshing Barn and The Grain Store in the week before Half Term. They look fantastic and we are very pleased with them. As usual at this time of year we are busily decorating in the cottages and generally preparing them for the coming season. Acorn and Maple are starting to look really pregnant now. They are thoroughly enjoying the fodder kale that we planted last summer. It gives them an interesting change from their dry diet of sow nuts. Apart form some stormy weather we escaped the worst of the winter weather here tucked away in the valley. 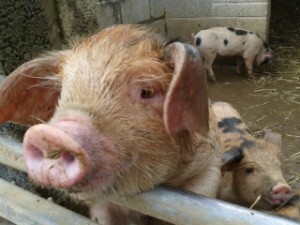 Good news this month as Phoebe is in pig and due to farrow at the end of April. It was worthwhile all that hard work over Christmas. All three pigs are now expecting. It is now just a question of keeping them warm and well fed and let mother nature take its course. The garlic has been planted in the allotment officially starting the veg growing year. We must sit down now and order in the seed, onions and seed potatoes so we are not all in a rush come March. We were able to prune some of the apple trees in the orchard this month. Hopefully this should encourage some productive new growth.